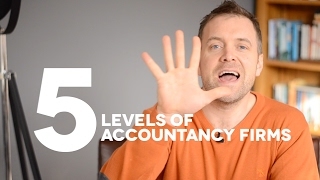 There are five levels of accountancy firms. Most accountants are aware of the first three levels, but not a lot of them have been told about the highest two levels that you can actually take your accountancy firm to. What I want to do, is talk you through each of the five levels, explain what the characteristics are of each of them, how you transition from one to the next and what the ultimate two levels of an accountancy firm are. Now I’ve been working with leading accountancy firms around the world for quite some time now, helping them to systemize and automate their business and so I’ve got to see lots of different accountants, got to really understand them from the inside out and understand what the challenges are, where they think they are, and actually showing them where they can get to and where they really need to get to, moving forward. If you don’t want to read this, just watch this video. It’s exactly the same. So the first level of accountancy firms is chaotic. Now you might laugh but everyone has to go through this phase. Basically, it’s when you start out in business. Hopefully it’s a phase that you’re going to pass through, you’re not going to stay there for too long. But whenever you start anything, there is no way that you can know all the answers, you cannot see the full extent of any journey before you start it, so whenever you get into business, whenever you start your accountancy firm, it’s always going to be chaotic to start with. Now that’s absolutely fine because you’re going to be getting customers, you’re going be getting staff, you’re going to be setting up systems, you’re going to be delivering your service, etc, etc. So you’re going to hit so many challenges and you’ll have been through your training to become an accountant but perhaps no-one’s ever shown you how to run a successful, thriving systemized business before. So you’re always having to try and figure that out. Now the word chaos isn’t as actually a negative a phrase as you might think. I’ve got this wonderfully old dictionary that I nicked off my parents’ bookshelf many years ago and the definition of chaos in this is ‘the shape of matter before it was reduced to order’. And so whenever you start anything, there’s always going to be disorder to it and in order to move beyond the chaos, you’ve got to start bringing order to proceedings and that’s the next level that you need to move to. So the next level of accounting, is where accounting’s been for the last hundred or so years, which is the compliance level, or just the accounting level essentially. So this is where, for a long time historically, accountants have brought value to their clients. This is where accountants have been seen as valuable people in the world, very useful allies to have in your business, very trusted people, a great profession to be a part of and this is where accountants have made all their money….. up until now. So this level is all about ensuring that that client is legally compliant and that you’re accounting for what’s happened in the past. So you’re making sense of all the numbers and presenting them to your clients. Now in order to get to this level, you will have had to have put certain systems in place to allow the delivery of that compliance function. This is where, like I say, accountants have made their money for many, many years, where they’ve delivered the value. The problem with this is cloud accounting has come along, the likes of Xero and kind of revealed how you do your tricks really, they’re like the masked magician in the fact that I now, as a business owner, know how to submit my VAT return, I know how to produce payroll quite easily, so why am I paying you all of this money again? So all of a sudden, if you’re just providing that compliance function, that level of accounting, the value of it has been diminished and it’s going to get less and less moving forward. Now, despite the fact that there is all this technology about – Receipt Bank and Xero for example – it’s amazing how many accountants really haven’t got to grips with this yet. And although they’re providing the compliance function, it’s what I would consider to be at the lower end of providing the compliance function, it’s barely just getting this information out of the door. I was with a business owner last week and he’s got a very successful business, got a great accountant and he didn’t get his year-end accounts until eight months after his year-end. So that’s an accountant supplying the compliance accounting function of the business but really it’s borderline chaos and surprisingly, I believe that the majority of firms of accountants, are stuck between these two levels of chaos and compliance. But you know what? It’s not your fault. You were trained to become an accountant and then you find yourself thrown into the deep end and you desperately look around for help and who do you get help from? Other accountants who are also in your industry, also facing challenges and yes, they may have solved some of the problems in your industry but we need to look out of it, we need to look wider, we need to look to the rest of the business world because an accountant is no different to any other business. That is a business. That is what you do as an accountant. You are no different to any other business. What I’ve been able to do, is to bring thinking from outside of the accountancy world (because I’m not an accountant.) I’ve worked with businesses in the trenches for many years, and what I’ve been doing is bringing business thinking into accountancy firms to help them think and operate like a successful, thriving business, that’s what I do. So that’s what you need to do if you’re going to transition from this compliance accounting level, the chaotic level, into the next level of an accountancy firm. So the next level of an accountancy firm is the financial level. This is where we have got the accounting done, we have got the compliance function done, we’re no longer chaotic, we have a sense of order in our firm and we’re able to present the numbers to our clients in a timely fashion, so that they can make better decisions about their business moving forward. Accounting is looking backwards, financial is looking forwards and taking that data and helping them, ultimately, to make those decisions to grow their business. Now, in order to be at this level, you have to have systems in place in your accountancy firm; you have to be getting the compliance function done on time, you have to be getting your clients to behave as you want them to behave and that is how you’re going to be able to deliver this level of service. However, there is a problem with this level and the problem is, is that I see a lot of accountancy firms believe they’re at this level, purporting to be at this level, presenting that they’re at this level on their website, that they’re providing this finance function. But when you really scratch past the surface and dig down, a lot of accountancy firms, unfortunately, are still providing a compliance function because they’re not able to get the information out in a timely enough fashion. Now the reason for this is probably down to your clients, because they’re not getting things done on time, when you want them to do it, they’re not paying you enough, they don’t value your service enough, they’re not getting their accounts reconciled on time, they’re not getting their sales invoices raised on time or collecting their debts quick enough. And so you’re desperately trying to provide this higher level function, but you’re still scrambling around just trying to get your clients to behave as you want them to behave and the reason for this, is because you don’t have ALL of the systems in place that you need. Because if you did, you’d be able to actually transition onto the next level, which is far more exciting, where you can give far greater value and get paid a lot more money for it. And so what happens is accountants are at this level, they believe they have systems in place, because by now you will have been investing in technology, you’ll have been kind of assembling your system, you’ll have a CRM system, you’ll be fully invested into cloud accounting and you will start to be embracing technology and systems in order to be able to deliver this financial function. However, when again, you scratch past the surface, you realise that the systems aren’t really there because, let me revert back to my trusty dictionary again, and explain the definition of a system. That is where so many accountancy firms fall down because yes, you will have some systems in place that maybe enable you to deliver your services but you don’t have ALL of the seven systems in place that you need for it to be considered as one system; for it to be considered as a connected whole. So you might have certain parts of the system that deliver the service, but perhaps you’re still relying upon referrals, and if you’re relying upon referrals then your marketing is really reliant upon luck; that you’re going to get the right people knocking at your door. Who’s turning up and how are they showing up at your door? You can actually control that if you have the correct systems in place. And also, maybe you’re still reliant upon recruitment companies to bring in your staff, so again, you’ve got a real vulnerability there because you don’t have a staffing system in place that gets a constant flow of the right type of people with the right skillset and the right culture fit, wanting to work in your accountancy firm, queuing up, knocking at your door, ready to start working with you. So they’re just two holes that accountancy firms tend to have in place, these big gaping holes, therefore you cannot have this connected whole system in place and therefore you’ve got vulnerabilities. Also, if you’re at this financial level, you will probably have other systems in place that you believe are systems but there are gaps for things to fall through. They’re not probably fully automated, they’re not sending reminders to clients on time and getting them to do things via emails and via text and therefore what happens is, your staff are still chasing around, trying to get your clients to do what you want them to do. This means that you cannot fundamentally deliver the financial function that you say you can deliver and again, it’s not your fault. There is a way round this, there’s a way we can solve this, because when you solve this, you move to the next level. So the next level up (and this is where it starts to get really exciting) this is where you start to give massive value to your clients and where you get paid handsomely in return. It’s where your staff will feel fulfilled and where you’ll attract more staff who want to work with you and work for your firm and it’s where you’ll start to get a constant flow of the right type of customers as well. This next level is the entrepreneurial accountancy firm. So with entrepreneurial level accountancy firms, you have all of the seven systems in place, you have removed all of the cracks and completely sealed them so every single eventuality is considered. Only once you have all of those seven systems in place, do you really have a full system in your accountancy firm that will allow you to transcend beyond providing the financial function and moving into the entrepreneurial function. So what this level enables you to do is to not only take that data and present it to your clients for them to make better decisions BUT you are actively helping them to make those decisions. You are digging down past the numbers, you’re digging down to the reports that are beyond that, the smaller reports that make the larger reports up. You’re fully aware of your clients’ goals and what they’re trying to achieve, not just in their business but in their personal life as well and you’re constantly helping your client to keep on track towards those goals. You know what their main obstacles are and you’re always working towards overcoming those obstacles. They’re the only four things that can contribute to their turnover and therefore contribute towards the growth of their business and just by tweaking each one of those, we can really start to help the clients to grow their business. All these type of questions can really start to dig down and really help the client to understand the answers themselves, because they’ve probably already got the answers. For me, the entrepreneurial level accountant is just helping your client to realise them and then, once we’ve got that going, yes, you can dig down into increasing their profit margin….. how can we reduce their overheads, how can we increase efficiencies and maximise their capacity, how can we do all of these things? And to make this level really work, you have to have a niche. To be able to provide the entrepreneurial level thinking because it’s too great a challenge for you to expect accountants to understand any and every business and how to grow them. But once you start to niche and specialise in one, two, or three (at an outside push) industries, that’s when you can really attack it and really get your staff trained up in entrepreneurial level thinking. Ideally, one niche is where you win. If you want to absolutely own this (and I’m involved very closely with an accountancy firm where we’re doing this and absolutely smashing it) it comes down to the fact that you become THE leading experts in one niche. So if we’re working on all of these areas, really partnering their businesses, really helping them to grow, this is the level where you MAXIMISE THE LIFETIME VALUE of your clients. It’s not where you give better value, or where you give great value, it’s where you MAXIMISE the LIFTIME value of your clients. Get this right and they will never leave you but also, by getting all of this right, by getting all of the systems in place, all of the seven systems in place, with no cracks, using automation where you can, training your staff to think entrepreneurially, to help your clients by helping them to grow their business, to improve their profit margins… once you’re at this level, this then allows you to transcend to the ultimate, highest level of any accountancy firm, which very few, ever get to. And the final level that any accountancy firm can get to is the experiential level. What I mean by that, is at this ultimate level, it’s where you are providing incredible, world-class experiences for your clients. Now, in order to be able to do that, you have to be providing the entrepreneurial level, you can’t skip a step. You can’t be providing the compliance function very well and think I’m going to jump to experiential, you can’t do that. You have to work up every single step and nail the first one before you can transcend onto the next one up. But what the experiential level is all about, is where you provide incredible, world-class experiences. If Richard Branson were to take over your business and to Virgin-ify it, what would the Virgin experience be? It’s that level we’re talking about because your clients will remember how you made them feel long after they’ve forgotten what you’ve done for them and the way you change how somebody feels is through the experience that you provide them with. Now, we’re getting really deep here and I only take a few clients onto this highest level where we look at the complete customer journey, where we make every step absolutely world-class and provide this incredible experience. At this level, you’re already maximising the lifetime value and this is where you ensure they never go anywhere else. At this level you can charge an absolute premium and you can completely open up their entire network and you will get referrals at this point, but you’re not reliant upon referrals because you’ve already got your attraction and marketing systems in place but the referrals at this level, are just the icing on the cake. This is where you’re not just sending out management account reports, it’s where you’re sending out management account videos, with impact reports that go out seven days after month-end ahead of your management account meeting. Where they’ve already sent and automated text message and an email about it. And it’s where you’re sending gifts, and where you’re delivering events, and just taking this whole experience of working with you to a complete other level. At this level, you don’t compete. You don’t really compete at the entrepreneurial level because there are not many people there. At this level you certainly don’t compete….. you dominate. If you want to dominate, this is where you have to be. So they are the five levels that you can move through. They’re the five levels that you can move through and it’s not to say that when you get to financial or when you get to entrepreneurial, everything’s perfect and it’s not sometimes chaotic, of course it is. We always keep spiralling back through these but we just don’t want to stay at the bottom levels, that’s all. Now, cloud accounting opened the door to the financial level, and a lot of accountancy firms thought that’s where they had to stop… it isn’t. Keep moving through it, keep going beyond. That level allows you to transition to the next one and into the final one, but it’s the entrepreneurial level thinking where everything begins to change. All you need to know, is what all of the seven systems are, where to start with them and how to implement them so there are no cracks. Once you’ve got that and you’ve started to do it, you will be able to implement a full system into your accountancy firm, where everything is operating as a connected whole, because that is where you will win.